Our goal, which we have chosen to accept, is to turn some of the camp land that looked like this end of last year into a lush green deer salad bar. Yes, this is not going to be easy. But no one ever said it would be easy, just worth it! Actually, we had the selected spots bulldozed and even planted a late cover of rye grass that did not do well due to the late planting and extremely cold temperatures of the winter. But we’re getting ready to get back on site and do plot clean up and get the soil ready to plant later this year. I’ll be out this week getting soil samples to take to the local extension office for testing. Based on that we’ll apply lime in a couple weeks and then let them sit for a few months. Then it’ll be planting time. I’ll report in on conditions at the CPHC later this week. 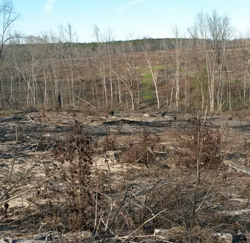 The property has been planted in pines since my last visit so I’m anxious to see how that has turned out. Springtime! That means flats fishing for trout and reds. And that’s exactly what camp partner Gary has been doing. When I first saw this pic I did a double take. Those are some big trout! So I asked and got the whole story to share with you. BTW. 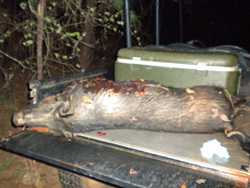 The photo below of his “take home” is what we call a nice mess! 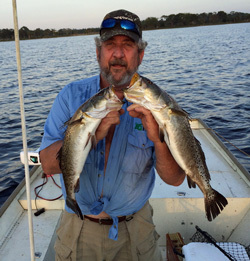 Springtime is a special time for our flats fishing on the GuUlf of Mexico in Florida’s ‘Big Bend” region! Some call it “Florida’s Nature Coast” these days, and others call it “Florida’s Forgotten Coast” too, but to some of us it’s simply the “Big Bend” region. It got that nickname since it is the area of Florida’s Gulf of Mexico coastline where it curves from a north/south coastline toward the west, where it borders the state’s panhandle region all the way out to Pensacola. Fishing the flats can be special at times, and each spring seems to be among the best each year. 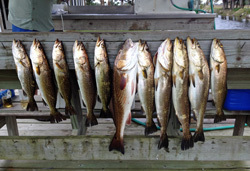 These trout and redfish were caught in about two feet of water, very close to the shoreline. 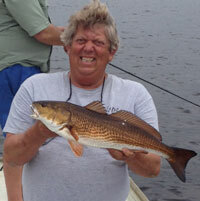 Speckled Sea Trout is a favorite target, as are redfish (also called “red drum”) this time of year on the flats. The flats primarily have sea grasses growing on the bottom, and those grasses grow up to about ten feet in depth, which means in this area of the state, where there are no beaches by the way, the flats extend several miles off shore in shallow water throughout the entire region pretty much. The full catch picture has a trout limit and one nice red in the center. Trout have to be at least 15 inches to keep, with only one per person allowed over 20 inches, so this catch is a very good one for the two of us who fished that day recently. My cousin Lee from Lookout Mountain, Georgia caught the red, and we each caught a 24-inch trout to round out our trout limit. In the photo I’m holding both 24-inch trout for a closer look. One of our favorite ways to eat redfish is what we call “redfish on the halfshell”, where we filet the fish but leave the skin and scales on it. To cook, we simply apply a little olive oil and our favorite spices, then place over a hot charcoal fire skin/scales down and leave closed in the grill until the shoulder meat on the filet just starts to divide and the filet begins to ooze white bubbles throughout. This is indication it is done, and it is important not to overcook since it will dry the fish out. Then to eat you simply scrape or spoon the meat from the skin, which is very easy to remove, and enjoy.